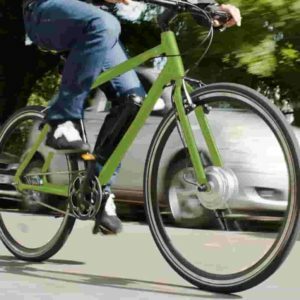 If you’re looking into getting a new bike for your daily commute then the likelihood is that you’re wondering what all the hype is with hybrid electric bikes – are they worth it? Well, to put it simply, the answer is a resounding yes! Before you opt for a hybrid electric bike, otherwise known as an eBike, it’s understandable that you might want to know how they differ from your standard road or mountain bike and how they match up to the benefits of a car, so let’s lay it out for you. 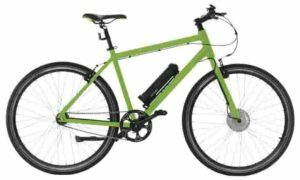 Whilst road bikes have their own unique set of benefits, being designed specifically for long distance rides and racing, for those of us more in the market for commuting by bike or leisurely weekend trips, hybrid eBikes are certainly the best option. They provide assisted travel through a battery powered function, which reduces effort on the rider’s part. eBikes are capable of reaching speeds of over 15 miles per hour, meaning that they come close to the average city speeds of a car, whilst also allowing you to beat the traffic. eBikes can give you the push you need whilst still offering health benefits, as their pedal-assist function still allows for a decent workout. With vastly reduced operating costs compared to a car, and an incredibly reduced environmental impact, eBikes provide an excellent option for those of us seeking to do our part for the planet whilst on a budget. The charging costs are but a fraction of fuel costs, whilst yearly maintenance costs don’t even come close to that of a car. They are able to travel anywhere between 18-95 miles per charge, making them the perfect option for your daily commute, and can be charged at any standard power socket. Hybrid eBikes truly do offer a multifaceted experience, allowing you to experience the best in on and off-road cycling and car travel without having to expend too much energy in getting from A to B. They allow you to carry shopping as you ride as their structure is strong enough to withstand heavier loads and the electric function means you won’t feel the weight of the load. If you’re looking for an in-between option rather than buying a road bike, car or motorbike, then a hybrid eBike offers the perfect solution. With decent eBikes increasingly available at remarkably affordable prices, there’s no question as to whether they’re worth it. So which are the best models on the market under £1000? 36v Lithium-ion battery charges fully in three hours, to give 30 miles worth of cycling – more than enough to make your daily commute. SRAM® Automatix gear system automatically adjusts gears according to your speed, allowing you to focus on the road ahead without distraction. 14 day trial available, allowing you to try before you commit to ensure it’s the right model for you. 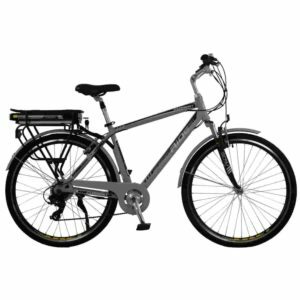 Comes with a high torque 250w motor, which allows you to accelerate up to 15 miles per hour – your speed can be increased even further by pedaling. Lightweight and durable aluminium frame. With the AEROBIKE X-Ride, you can renew your love of cycling and gain that extra helping hand you need to switch from driving to cycling into work. It’s intuitive sensor and automatic gear-changing features contribute even further to the ease of use, meaning that you can focus on riding safely. Although it’s battery power falls short of that of more expensive models, 30 miles is more than enough for the average user to make their daily journeys, and with only 3 hours’ reboot time, you can quickly charge up ready for your next trip. 250w rear-drive motor easily reaches top speeds of 15.5mph with specialist features to increase power when riding up-hill. Das-Kit L7B display allows user to manually set the power output of the battery and motor, so you can get just the right of assistance you need to make it through your journey. 6 levels of pedal-assist and 21-speed system make for an intuitive and easy ride. 48v Lithium-Ion battery can provide up to 75 miles of assisted cycling. Handy integrated USB port lets you charge up your phone and other devices as you travel. Although the price tag is significantly higher than the Aerobike X-Ride, you certainly get value for money when it comes to battery power. If you’re planning on taking longer journeys, then this might be the right option for you, although for the majority of users 75 miles is an unlikely target to hit so may simply be a little excessive. Needless to say, the extra power also means extra charge time – between 5-8 hours to be exact – meaning that you’ll have to wait a little longer before being able to hop back on the road again. 7-Speed Shimano drivetrain with Revoshift shifter allows for great range of cycling speeds. High quality smooth aluminium alloy brakes, comprehensive suspension, adjustable handlebars and padded saddle with zoom suspension make for a comfortable ride. Supplied 90% ready assembled, meaning minimal initial set up effort. 250w rear wheel mounted motor packs a powerful punch. The Pro Rider Current eBike is a great option for the price, although coming in at a higher cost than the AEROBIKE X-Ride, with incredibly similar features, it makes sense to go for the cheaper model. However, the design of this bike has a real focus on comfort and ergonomics, making it the top choice for a comfortable ride. If you’re longing to hit the road on two-wheels but need that added oomph, then a hybrid electric bike provides the ultimate solution. With many of us wanting to avoid public transport on our daily commutes, but unwilling or unable to drive, an electric bike is a great way to avoid the stuffy tubes and frustrating traffic jams alike. Electric bikes also offer a great solution for those who are less fit or not as mobile as they once were, as they allow you to experience the joys of cycling without the need to channel your inner Lance Armstrong. 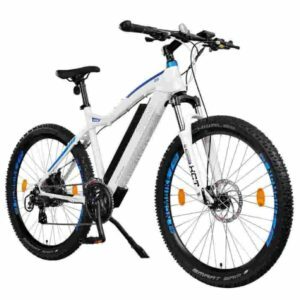 With eBikes becoming increasingly affordable, as you can see here it is certainly possible to acquire a top of the range model for less than £1000. As far as the best choices for hybrid eBikes go, these are some of the top models on the market for this price-range. Coming in at an incredibly reasonable price, and packing a very respectable 30 miles of power-assisted travel into each charge, the AEROBIKE X-Ride is the top pick when it comes to eBikes. For those seeking to travel a little further, the NCM Moscow eBike provides an excellent alternative, with a whopping 75 miles attainable with every charge.